Consider making delicious homemade gravy with your meal. You can make your own gravy with three simple ingredients--fat drippings, flour and water. Although gravy is not a healthy stock to add to your meal, it does add a rich flavor. It is important to watch the gravy constantly and to stir it continuously to ensure that it does not scorch or separate. Impress guests with this homemade dish once you master the art of making gravy. 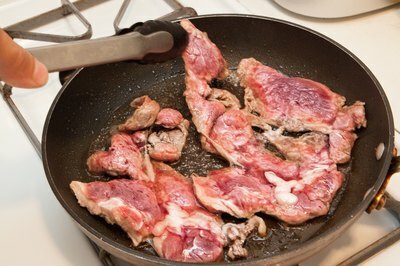 Cook the beef in a skillet, pan or baking dish to reserve the fat drippings needed for the gravy. You cannot prepare the gravy until the meat is finished cooking. 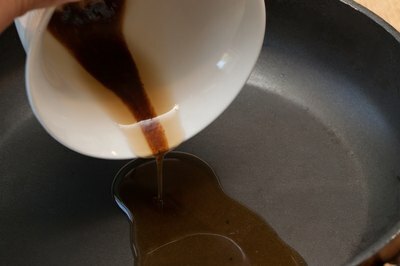 Remove the beef fat or drippings from the bottom of the pan with a spoon or ladle. Set aside the collected fat drippings in a bowl. Reserve at least 2 tbsp. drippings for the gravy. Run the fat through a sieve to remove any stray particles. 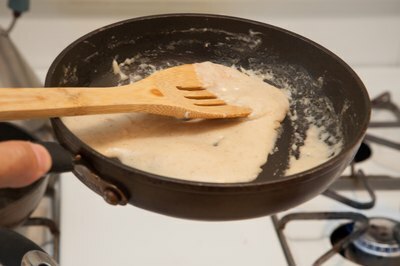 Pour the strained fat into a skillet, and place the skillet on your stove top. Mix flour with the fat in equal amounts. For example, 2 tbsp. fat requires 2 tbsp. flour. Turn the heat on to medium-low. Stir the gravy until it turns brown and begins to bubble. Heat 1 cup water or milk before adding it to the beef gravy mixture by tempering the liquid. 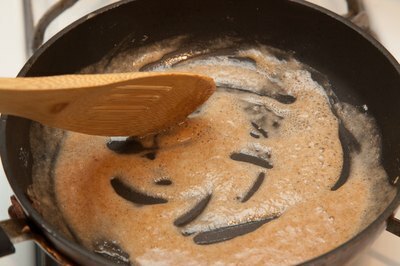 Tempering the milk prevents lumps from forming in the gravy. Add a small amount of the hot gravy mixture to the liquid to make the temperature rise slowly, and stir the liquid to distribute the heat. Remove the skillet from the burner. Slowly add the warmed, tempered liquid to the gravy mixture while continuing to stir. Place the skillet back on the burner once the liquid blends into the gravy mixture. Turn the heat up to medium-high, and bring the mixture to a boil. Stir the gravy to keep the fat from separating from the liquid. Cook the gravy until it reaches the desired thickness. The longer the beef gravy cooks, the thicker it will become. Remove the gravy from the heat once it has reached the desired consistency. 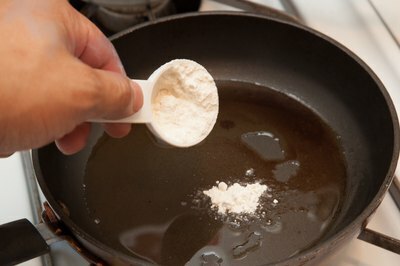 Add more fat and flour to each cup of liquid to further increase the thickness of the gravy. Thick gravy has 3 tbsp. 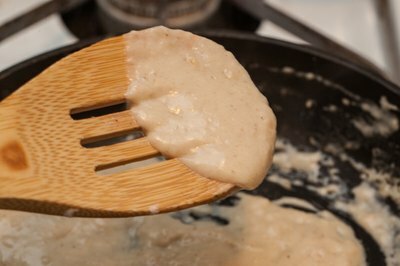 each fat and flour, whereas very thin gravy contains only 1 tbsp. of each of these ingredients. Use soup stock or bouillon instead of water or milk to add flavor to the gravy and to change the gravy's texture. Whisk away any lumps that form in the gravy. Do not leave the gravy unattended to prevent it from burning. This homemade gravy recipe uses those precious pan drippings for maximum flavor! It's perfect for turkey or chicken.